This 5-bedroom luxury villa has an absolutely gorgeous layout which includes a sparkling private pool and an array of well-appointed amenities. 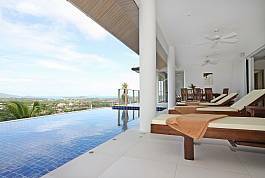 Villa Naiyang is a perfect holiday home for a large family or group to experience an unforgettable vacation to Phuket. This unique 5-bedroom fusion villa successfully blends modern design with Asian features and Thai decoration. 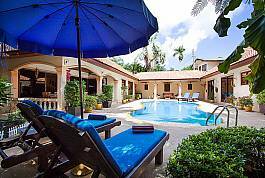 It is nestled in a quiet area only 1 km away from Rawai beach and features a private pool with garden, full western kitchen, lots of lounging space, laundry room, and more. 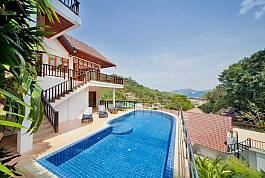 Overlooking Patong Bay from a beautiful elevated location at Patong, this five bedroom villa is a holiday rental you will not forget. Balinese-styling and spectacular sea views make this five-bedroom villa a treat for the senses in a hillside location that provides ultimate privacy along with proximity to all the action of nearby Patong. Discover the beauty of Phuket while staying in this welcoming abode in a convenient central location. The 5 bedroom villa accommodates 10 people in its regular configuration, and extra beds are available for an additional fee. Talk about sharing a holiday of a lifetime with good friends and extended family! 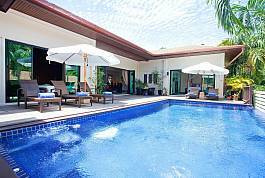 Situated just 1.5km from Rawai Beach, this five-bedroom villa sits in a peaceful green location and combines Asian-style elegance with modern luxury. The sea-view private pool has many special touches, like underwater jet spas and an in-pool bar area. 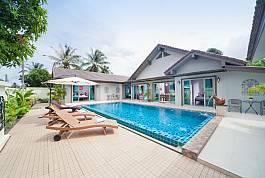 Just down the road from Naiharn Beach, Rawayana Pool Villa is part of a newly-constructed villa community which offers guests upscale accommodations in addition to a convenient location. With 5 bedrooms, private pool, 2 living rooms and indoor/outdoor dining, Rawayana Pool Villa will certainly exceed expectations. This five-bedroom villa with nearby tropical jungle provides a wonderful feel of nature, space and exclusivity – and it’s just 1 km to the beach. This is a nature-lovers paradise and a truly peaceful getaway on lovely Phuket. 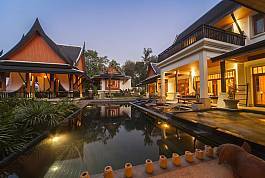 Thai and Asian elegance are on full display in this gracious and stylish villa. It features the special touches and comforts that make a Phuket getaway truly memorable. 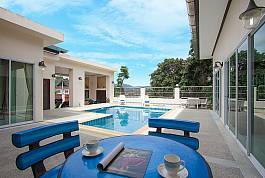 This five bedroom villa in Rawai was once the holiday home of the Malaysian Royal Family. Style and luxury blend together with ease at the Villa Narumon. The swimming pool in the garden and the palm trees surrounding it will make you feel like you’re in a tropical island paradise and inside the villa you’ll find plenty of space and comfort. Villa Alangkarn Andaman really lives up to its name. With the best views of the Andaman Sea in the region, this five-bedroom villa stands out as one of the grandest around. This villa really is something special with a luxurious interior, a sea-view infinity pool and a location just 2km from Nai Harn Beach.